December | 2015 | Can Men Cook? OK. Three hours of cooking and washing up…just for once, it felt like being in a professional kitchen. You know, that horrible feeling of lack of control because you are prepping 5 different dishes. Only one casualty. A plastic egg slice got too close to the flame…so it is in the bin now. Otherwise, ok! 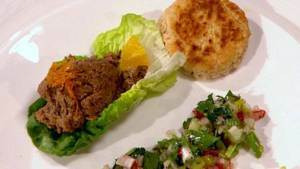 Beef in beer was easy – just fry off an onion, then the beef (coated in flour and paprika) and a mushroom. Wash out the pan with London Pride beer. Add a bit of salt and pepper, Lea and Perrins and mushroom ketchup. It sitting there now, waiting for us later…will put dumplings in about 6, to eat at 7:30 With mash and mashed carrot and swede. Cranberry sauce – easy peasy. 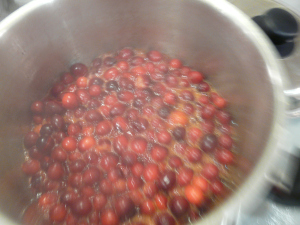 Cranberries into a pan. Add the zest and juice of an orange. Slow boil for 10 mins. Add cloves, ginger and cinnamon. Mash with potato masher (yes – it works). And let cool for tomorrows feast…after adding a little port! And then the two stuffings. Both based on sausage meat as the lubricant. The Sage and Onion (guess what’s in that then?) also has breadcrumbs and a beaten egg. The chestnut and apple (yep, you guessed right) has a bit of mushroom too. I put the sage one under the breast skin of the turkey. The chestnut and apple is in a small Le Creuset casserole and will cook in the oven alongside the turkey – not everyone likes it – so more for me!!!! And all ready to go! You will need to scroll down and open up the original blog to see all the advice! Enjoy your Christmas Feast! Earlier today we had 67 words that must be a record for a Christmas Turkey recipe! But at least with those timings, you can be confident of the main attraction being OK? I said earlier, perhaps you would like a little more detail? Here we go! I think the essence (and this is true for all our recipes and ideas in my book “Can Men Cook?”) is to keep things simple. This is even truer on this particular day, which can be a bit stressful if you let it. As there is likely to be a crowd of revellers interrupting and drinking and waiting, for many of you, this is even more important. Where do I begin? This year – managed the Cranberry and Orange Relish a little early – bought fresh cranberries in panic 1 week early, just in case they run out…as you do. Christmas is nearly always around the 25th, isn’t it? And why does it always take us by surprise??? My favourite recipe – always asked for when we visit! Isn’t it lovely when you are visiting friends and they request you to make one of your favourite dishes? Such a feather in cap moment! We tried for frozen chicken livers at our butchers. “We can’t get them now. The supplier has done an exclusive deal with Tesco, and they won’t let them supply small businesses”. OK – I’m only getting one side of the story here, but if true, my chagrin muscle is overwrought. So we got a pack in the supermarket…50p a pack – amazing value nutrition! You have to defrost thoroughly before use – I usually leave it overnight in the fridge. Open it up, and chop it in the pot – scissors work well. This saves losing any of the liquid (bloody, and tasty…). Hi there – it’s that time of year, and reblog seemed easiest!